This is the second and latest CD by the Kim Richmond's large ensemble. 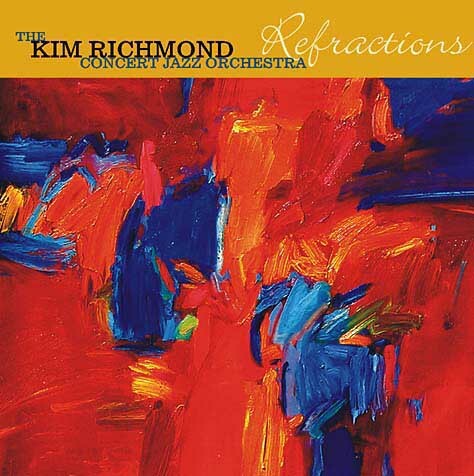 The album is titled "Refractions," by the Kim Richmond Concert Jazz Orchestra, a 24-piece showcase for Kim's writing and soloing abilities. The recording was made possible by a grant from the Jordan Family Foundation. One of the primary rules of traditional harmony is the avoidance of parallel 5ths. This composition breaks that rule one hundred percent, since the entire main expostion features that parallel interval. This device, however, provides a certain regal flavor. Glen Berger is the brilliant tenor soloist, while Rich Eames’ piano soars and skitters over the final statement. 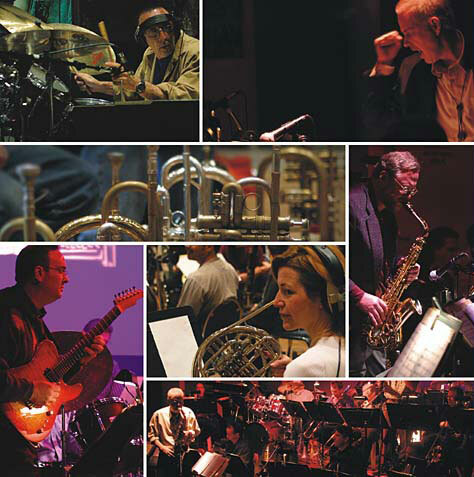 I consider this the centerpiece of the album, featuring the sounds, textures and sonorities that are unique to this orchestra, as compared to most other large jazz ensembles-- those of double reeds, multi-flutes and French horns. Bruce Fowler effectively solos on trombone and Ron King, on lead trumpet, brings the piece to a declamatory conclusion. This composition by Michel LeGrand has long been a favorite of mine. Its typical sequential construction is made less sequential as the composition progresses through a metamorphosis of moods. Piano soloist Bob Florence makes a cameo appearance, offering a beautiful initial statement of the sinuous melody, and the wonderful improvisations are by altoist Jeff Driskill and switch-hitter Ron King on trumpet. Phil Feather’s oboe has the final melodic phrase. This original of mine is a tribute to the late Bill Russo. The piece uses several stylistic devices for which Russo was famous during the time he wrote for the Stan Kenton Orchestra. The extensive talents of solo trombonist Bruce Fowler are featured over the moodiness of the main exposition section. Phil Feather contributes the delicious alto improvising before high-note lead trumpeter Mike McGuffy plays the final screaming melodic statement. The initial four notes of Franz Schubert’s “Serenade” are the basis for this composition, with bassist Trey Henry and drummer Ralph Razze establishing the exotic rhythmic mood. 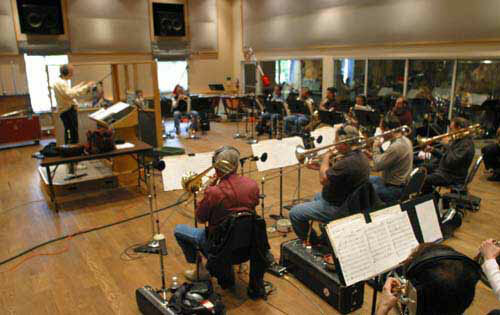 The solos are by the creative Rich Eames on piano and the poetic Steve Huffsteter on trumpet. My version of this old Victor Young standard was actually inspired by an interpretation rendered in the mid-60s. The “head” is based on the Herbie Hancock chord changes performed with the Miles Davis Quintet from that era. Trombonist Joey Sellers has the impressive jazz chorus. The title comes from the concept of viewing an idea from several angles, some of which make it appear askew. The melody is very simple and thread-like, over a floating ostinato and pad of (at the beginning) bassoon, French horns and trombones. A calypso vibe creeps in before some strong harmonic structures help the piece build dramatically . The soloists are inventive guitarist Tom Hynes and myself on alto. This old Country-Western tune is the basis for free-form improvising. The original tune is unusual, in its chromatacism, for a country song, and I was inspired to write this treatment of the “head” by a version of arranger Mike Barone (he says he copped it from J.J. Johnson). After a woodwind (flute, oboe, English horn, clarinet, bassoon) prelude, in which the French horns sneak in with the bridge melody, the dueting basses of Trey Henry and Ken Wild set the rhythmic mood. At the end of the exposition, and under Glen Berger’s tenor, the tune is orchestrationally “decomposed.” Interspersed with some written cued material are free-form solos by Berger, trumpeter Clay Jenkins, George McMullen on trombone, Bill Roper (tuba and voice) and myself on alto, with much of the orchestra supplying texture. We hear the return of mixed woodwinds at the end, but Roper’s tuba has the last say. This great arrangement by Mike Crotty has long been a favorite of mine. I have augmented it by adding an intro and ending, as well as French horn, tuba and percussion parts. I state this beautiful melody on soprano saxophone and John Yoakum has the delightfully irreverent improvised solo on tenor. I am seeking a broader palette for Jazz. I feel that all too often Jazz, especially for large ensemble, expresses only a small range of emotions - unlike classical music, which conveys a greater spectrum of feeling. Granted, with Jazz you get qualities not even remotely attainable with the classical idiom, i.e., rhythmic swing and feel, and a certain exhilaration and freedom. I wouldn’t give up those qualities for the world, but I’m still after a wider variety of colors and emotions. This emotional, musical palette is a large part of what makes up a musician’s style. Now, style can be an illusive term. Most often, it’s the result of a combination of one’s influences. In my formative years, I made it a point to write at least one jazz composition or arrangement per year, trying to “cop” or imitate a style of one of my influences. : Gil Evans, Thad Jones, Oliver Nelson, Gary McFarland, Bill Holman, or one of my other musical “heroes.” I was not always successful at copying them exactly, and perhaps that was fortunate,because as a result some of those efforts seemed quite original. Of course, I knew where the inspiration came from. I feel that in synthesizing all these impressions - along with other occasional independent or accidental discoveries - I have formed a style, or palette, of my own. To be sure, many of my influences come from the Classical realm - and the perceptive listener will discern some of them on this project (Puccini, Walton, Shostakovich, Korngold, among others). I continue to listen and let myself be influenced by musicians whose work I admire, mixing what I take from them with other sources and thereby expanding my own palette, or range of musical expression. When recording, I think we should try to capture the way the music occurs at a given moment in time. I do not agree with the process of overdubbing improvised solos; I believe that first takes are usually the best ones. That is ow the music happened at that point in time. It should retain spontaneity which is often lost with repetition. I hope the listener will enjoy something distinctive and perhaps inspiring in my approach to the large jazz ensemble. Like classical music, the ensemble work here is orchestral and symphonic in texture and sonority, but like jazz, it revels in improvisation and a certain sense of indeterminate freedom.